Incorporate the floral trend to everyday looks with the Sanguine Skirt by C/MEO Collective! 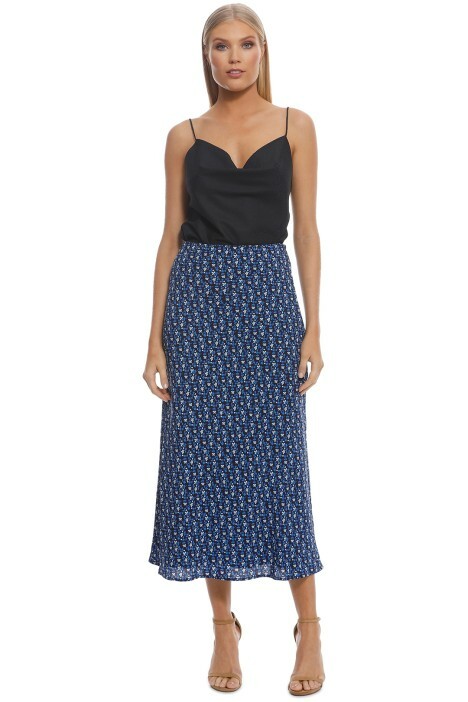 The blue midi skirt sits high on the waist and features a beautiful dainty floral print and a flowy silhouette. Versatile and feminine, rent it for a work function or date night. Look chic at your next work event by pairing the skirt with a silk button-down, silver chain link earrings, and a blush foldover clutch that’s available for hire. Check out our blog for our tips on how to get ready for work functions! Pair this skirt with an edgy black cami or try Curious Top in Navy by Keepsake The Label. LENGTH: This skirt is set is midi length.